In Romania’s Mediaeval capital of Bucharest, discover the extraordinary George Enescu Festival, one of the musical world’s best kept secrets. Held every second year in autumn, the George Enescu Festival brings together the world’s leading orchestras, conductors and soloists for a tour de force of music concerts. In 2019, the Festival opens with the Berlin Philharmonic and ends with the exhilarating Royal Concertgebouw Orchestra. In between, enjoy world-class performances by the London Symphony Orchestra, Orchestre National de France, Berlin Radio Symphony Orchestra, Vienna Radio Orchestra, State Academic Symphony Orchestra of Russia, Oslo Philharmonic Orchestra, Orchestre Philharmonique Royal de Liège and many others. Bask in the light of stars such as singer Sir Bryn Terfel and Academy Award-winning actress Marion Cotillard, violinists Maxim Vengerov, Sergei Krylov and Ray Chen, cellists Alexander Kniazev, Gautier Capuçon and Johannes Moser, and pianists Dame Mitsuko Uchida, Denis Matsuev, Nobuyuki Tsujii, Jean-Yves Thibaudet, Evgeny Kissin and many, many more. Two departure dates are available for this tour, each tour presenting spectacular symphonic concerts, world-class recitals and exquisite chamber music in Bucharest’s Romanian Athenaeum and Grand Palace Hall. For the complete Enescu experience, you can even combine the two tours and enjoy three weeks of magnificent masterpieces of music. Depart Australia or New Zealand in the evening on suggested Qatar Airways flights to Bucharest via Doha. Renaissance Tours or your travel agent can assist you with your flights and other travel arrangements. Arrive in Bucharest and transfer to the hotel (transfer included in tour price). The hotel is perfectly located in the centre of the city, a few minutes’ walking distance from the Romanian Athenaeum, the Grand Palace Hall, the Old Town and other major attractions. This evening, join Mairi and fellow music lovers for a welcome briefing and pre-performance talk, followed by a concert by the Würth Philharmonic Orchestra joined by Welsh bass-baritone Sir Bryn Terfel. Afterwards, enjoy a special welcome dinner with Mairi and fellow travellers. This morning, become acquainted with the city of Bucharest with a walking tour of Calea Victoria street and the Old Town. Initially paved with oak beams when constructed in 1692 and flanked by some of Bucharest’s most important and beautiful buildings, Calea Victoria developed into one of the most fashionable streets in the city during the early 20th century, when Bucharest was dubbed the ‘Paris of the East’. The Old Town is a lively jumble of narrow streets lined with shops and restaurants, and a sprinkling of historic churches. After lunch at a local restaurant, enjoy some time at leisure. In the late afternoon, enjoy a performance at the Romanian Athenaeum, Bucharest’s 19th century Neoclassical concert hall, by the Würth Philharmonic Orchestra. Conducted by Maxim Vengerov, the orchestra will perform Shostakovich’s Symphony No. 10 in E minor and the Andante Cantabile from Tchaikovsky’s String Quartet No. 1 in D Major, joined by cellist Gautier Capuçon. As a soloist, Vengerov performs Enescu’s Ballade for Violin and Orchestra. Afterwards, attend a concert by the State Academic Symphony Orchestra of Russia, performing Enescu’s Pastoral Phantasie, Erich Korngold’s Violin Concerto in D Major and Tchaikovsky’s Manfred Symphony in B minor, with violinist Ray Chen. This morning, join Mairi for a pre-performance talk on the coming days’ performances, followed by lunch. The afternoon is at leisure, before a performance at the Romanian Atheneum in the late afternoon by the Kamerata Baltica, performing works by Enescu and Mieczysław Weinberg. In the evening, enjoy a concert by the Oslo Philharmonic Orchestra, performing Grieg’s Concerto for Piano and Orchestra in A minor and Bartók’s Concerto for Orchestra. Enjoy a morning recital at the Auditorium Hall, where pianist Marc-André Hamelin will perform Enescu’s Sonata No. 3 in D Major and Samuel Feinberg’s Sonatas No. 1, 2 and 3. Lunch is at leisure. Later, enjoy a performance by the Orchestre Philharmonique Royal de Liège of two works taking their inspiration from 19th century violin virtuoso Niccolò Paganini: Witold Lutoskławski’s Paganini Variations, and Rachmaninoff’s Rhapsody on a Theme of Paganini. In the evening, attend a concert by the Oslo Philharmonic Orchestra with cellist Johannes Moser, performing works by Enescu and Richard Strauss, including his tone poems Don Juan and Ein Heldenleben. Enjoy a morning recital by violinist Dan Zhu and pianist Gerhard Opptiz performing Richard Strauss’s Sonata for Violin and Piano in E♭ Major and Beethoven’s Sonata for Piano and Violin No. 1 in D Major. The early afternoon is at leisure before a concert by the Orchestre Philharmonique Royal de Liège of works by Bartók and Prokofiev. In the evening, enjoy a concert by the Romanian National Radio Orchestra and Choir performing Britten’s opera Peter Grimes, a tale of fishermen, death at sea, retribution and madness in 19th century Suffolk. Join Mairi for a morning pre-performance talk on the coming days’ performances. Then, spend an afternoon at leisure, with a suggestion to visit the Museum of the Romanian Peasant. Opened in 1906, the museum features the richest folk-art collection in Romania, with over 90,000 artefacts that trace the colourful and diverse cultural life of the Romanian people. In the evening, enjoy a concert by French piano virtuoso Jean-Yves Thibaudet performing sonatas by Schumann, Fauré, Debussy and Enescu. Then attend a performance of Verdi’s awe-inspiring Missa di Requiem by the Orchestra and Choir of the Maggio Musicale Fiorentino arts festival. Begin the day with a coach tour exploring life in Bucharest during the Communist Era. 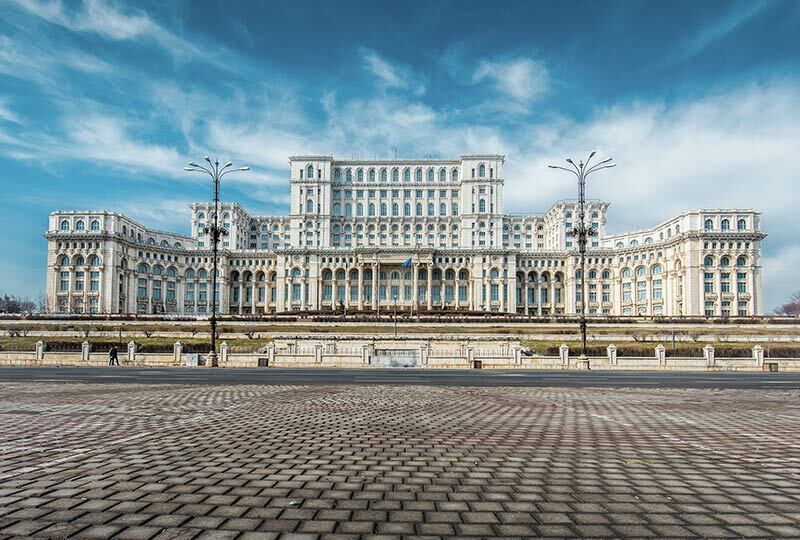 See the Palace of the Parliament, the world’s second-largest administrative building, built at the special request of Nicolae Ceausescu, the leader of Romania’s Communist Party from 1965 to 1989. Then visit Casa Scanteii, a replica of the famous Lomonosov Moscow State University, built for the purpose of bringing together all of Bucharest’s official press and publishing houses under one roof, and Primaverii Palace, the home where Ceausescu and his wife Elena lived the last 25 years of their lives together. This evening, attend a performance by Gerhard Oppitz of sonatas by Beethoven and Schubert, followed by a concert by the Orchestra of the Maggio Musicale Fiorentino performing Tchaikovsky’s Concerto for Violin and Orchestra in D Major with soloist Sergei Krylov. Journey out of Bucharest for a visit to Snagov Monastery. Dating back to 1364, the monastery island on Lake Snagov is reputedly the burial site of Wallachian prince Vlad III Tepes (Vlad the Impaler), the inspiration for Bram Stoker’s character Dracula. After lunch at a local restaurant, return to Bucharest in the mid-afternoon. This afternoon, the Orchestre National de Lille performs Arthur Honneger’s oratorio Jeanne d’Arc au bûcher with Academy Award-winning French actress Marion Cotillard in the title role. In the evening, attend a concert by the St Petersburg Symphony Orchestra. This morning, discover Romania’s rich religious heritage, visiting the Museum of the History of the Romanian Jewish Community, the Metropolitan Church and Patriarchate Hill, the site of a 17th century cathedral considered the centre of the Romanian Orthodox faith. Return to the hotel in the early afternoon for time at leisure. In the evening, the Orchestre National de Lille will perform Berlioz’s Harold in Italy with violist Antoine Tamestit, followed by the St Petersburg Symphony Orchestra performing Enescu’s Isis, Shostakovich’s Violin Concerto No. 1 in A minor and Rachmaninoff’s Symphony No. 2 in E minor. Join Mairi for a morning pre-performance talk on the coming days’ performances, with the remainder of the morning at leisure to explore the city of Bucharest at your own pace. In the afternoon, enjoy a performance of Mozart’s Symphony No. 35 in D Major by the Camerata Salzburg, followed by an evening concert by the Orchestra and Choir of the George Enescu Philharmonic Orchestra performing Schönberg’s unfinished opera Moses und Aron. Walk to the Grand Palace Hall for a morning recital by pianist François-Frédérique Guy performing Debussy’s Preludes, Enescu’s Piano Sonata No. 1 in F minor and Brahms’s Four Pieces for Piano (the Klavierstücke). The remainder of the day is at leisure before a late afternoon concert by the Mahler Symphony Orchestra and celebrated pianist Dame Mitsuko Uchida, performing two of Mozart’s piano concertos, No. 18 in B Major and No. 21 in C Major. This evening, Amsterdam’s impressive Royal Concertgebouw Orchestra performs a concert version of Handel’s Agrippina, a tale of love, deceit and political intrigue in the court of aging Roman Emperor Claudius. After a morning at leisure, celebrate the conclusion of the tour with a special farewell lunch with Mairi and fellow travellers. In the late afternoon, enjoy a performance of Mozart’s enduring masterpiece Don Giovanni by the Basel Chamber Orchestra. Then, conclude your Enescu Festival experience with an evening concert by the Royal Concertgebouw Orchestra performing Tchaikovsky’s Symphony No. 1 in G minor Winter Daydreams, the young composer’s breakthrough work which displays both his musical inventiveness and his fondness for traditional Russian folk melodies. For those tour members joining the Treasures of Transylvania #2 post-tour, check out of the hotel in the morning and depart for Transylvania. For those not joining the Treasures of Transylvania #2 post-tour, check out of the hotel after breakfast and transfer to Bucharest Airport (transfer included in tour price), where tour arrangements conclude. Suggested flights on Qatar Airways to Australia or New Zealand via Doha. Renaissance Tours or your travel agent can assist you with your flights and other travel arrangements, including any additional nights’ accommodation, either before or after the tour. Australian and New Zealand passport holders do not require a visa to visit Romania.